Ian Johnston brings us his latest round-up of vital releases from Ace Records, one of the best re-issue labels in the world. Last year Ace issued a great compilation CD, Here Today! The Songs Of Brian Wilson. Celebrating the outstanding song writing ability of Beach Boy Wilson, the disc, compiled and noted by Kingsley Abbott, Mick Patrick and Harvey Williams, featured an eclectic selection of 25 artists performing the songwriter’s timeless songs. Focussing upon Wilson’s singular capability to reach the listener with emotionally charged material in an intimate manner, as an individual and collaborative songwriter (much of his early Beach Boy work was with Gary Usher and Mike Love, while the legendary 1966 Pet Sounds developed from highly delicate conversations with Tony Asher), Ace have now released the best twelve tracks from Here Today! The Songs Of Brian Wilson on heavy white vinyl. This is all housed within an eye-catching and lavishly illustrated inner sleeve. Here Today! obviously sounds incredible as an album and highlights the fact that, remarkably, Wilson’s compositions, either singularly performed with The Beach Boys or as a solo artist, readily translate into the hands of other musicians. From the six songs originally recorded for Pet Sounds (including early sixties pop singer ‘Bobby Vee’s committed ‘Here Today’, Betty ‘The Shoop Shoop Song’ Everett’s lush reading of ‘Good Only Knows’, jazz singer Carmen McRae’s dream-like ‘Don’t Talk (Put Your Head On My Shoulder)’ and the late Kirsty MacColl’s deeply moving and harmonious ‘You Still Believe In Me’), through to Hugo Montenegro’s 1969 loungecore reading of the Beach Boys classic ‘Good Vibrations’ and Darian Sahanaja’s (of the power pop band The Wondermints, who since 1999 have been member’s of Wilson’s touring band) Beach Boys–style reworking of the ‘lost’, early 1990s rare composition, ‘Do You Have Any Regrets?’, Wilson’s character always shines through. ‘Little‘ Peggy March’s anthemic version of The Beach Boys 1967 Wild Honey album number ‘Aren’t You Glad’, West Coast vocal group The Castells’ 1964 single ‘I Do’ (written, arranged and produced by Wilson) and Johnny Welles’ heartfelt 1967 reading of Wilson and Russ Teitleman’s 1965 song for Glen Campbell, ‘Guess I’m Dumb’, only confirm the songwriter’s genius. Here Today! 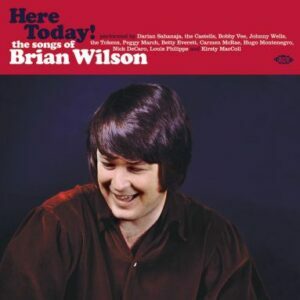 The Songs Of Brian Wilson, on CD, album, or both formats, is a compulsory purchase for any Wilson/Beach Boys devotee. This great follow up to Ace’s superb 2013 compilation Bluesin’ By The Bayou, Rough ‘N’ Tough and the equally magnificent 2014 collection Bluesin’ By The Bayou Rough ‘N’ Tough, continues to focus upon blues musicians from South Louisiana and South East Texas, discovered and recorded between the late 50s/early 60s by J.D Miller and Eddie Shuler in their Crowley and Lake Charles studios. 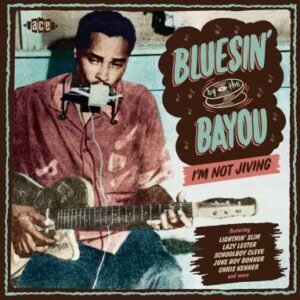 Once again masterfully compiled and noted by Louisiana popular music expert Ian Saddler, Bluesin’ By The Bayou: I’m Not Jiving (the 14th CD in the Bayou/ J.D Miller/Saddler series, overall) captures the raw form of South Louisiana blues, with a dash of Zydeco thrown in for good measure, performed by some of its greatest practitioners at the top of their game. Unbelievably, 10 tracks are previously unissued or alternate cuts, while the remaining 18 are rare as hen’s teeth. Blues legends Lightnin’ Slim and Lazy Lester (a pivotal part of J.D Miller’s recording unit) are featured here. Harmonica player/guitarist/vocalist Lazy Lester delivers the punchy ‘I Told My Little Woman’ and the lonesome ‘Patrol Wagon’, while guitarist/vocalist Lightnin’ Slim demonstrates why is he is often rated as one of the top five bluesmen of the 1950s, with an alternative take of the agitated ‘Miss Fannie Brown’. Swamp blues king harmonica player/vocalist Slim Harpo, beloved by The Rolling Stones, makes his unmistakable presence felt with the haunting ‘Things Gonna Change’ and a dynamic version of ‘Wild About My Baby’. Other gems include Silas Hogan’s spectral ‘I’m A Mojo Man’, Henry Gray’s rollicking ‘I’m A Lucky Man’, Boozoo Chavis’ spooked Zydeco influenced ‘Oh Ho She’s Gone’ and ‘Bye Bye Catin’, while Texan blues veteran Juke Boy Bonner delivers the title track, the ragged glory of ‘I’m Not Jiving’, and is the CD cover star. Looking for top draw, primeval blues? Look no further than Bluesin’ By The Bayou: I’m Not Jiving. No, really, I’m not jiving. The Ace Golden Age CD series has always been popular and has often received many critical plaudits. 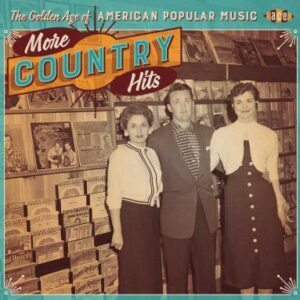 More Country Hits is the second edition in the country genre of The Golden Age Of American Popular Music series (there is also a ‘Country Edition’ volume in The Golden Age Of American Rock ‘N’ Roll), again compiled and noted by Tony Rounce, and stands the equal of both previous releases. Assembled here are 28 tracks, recorded during the 1950s and early 1960s, which defined classic country music. Including just about every major selling country act of the period, this compilation makes you realise just how far standards have fallen in what is laughably described as contemporary country music in 2016. Opening with the ill fated ‘Gentleman’ Jim Reeve’s sombre 1957 smash hit ‘Four Walls’, the lush vocal sounds of which came to dominate music produced in Nashville from that point on, and ending with Marty Robbins’ 1956 soaring version of ‘Singing The Blues’, More Country Hits delivers just what it says on the cover. From more conventional, mainstream country (the equally ill-fated Johnny Horton’s John Wayne film soundtrack theme ‘North To Alaska’, Stonewall Jackson’s country reworking of the gospel standard ‘Mary Don’t You Weep’ and Eddy ‘The Tennessee Plowboy’ Arnold’s ‘Chip Of the Old Block’) to more modern rockin’ material (Carl ‘Blue Suede Shoes’ Perkins’ hepcat anthem ‘Boppin’ The Blues’, country legend George Jones’ neo rock ‘n’ rolling ‘Who Shot Sam?’ and Jerry Lee Lewis’ beautiful reading of Charlie Rich’s ‘I’ll Make It All Up To You’), More Country Hits features most of the big names of the music from that era. And that, of course, includes Johnny Cash and his spirited, 1959 hit remake/remodel of Leadbelly’s prison song ‘On A Monday’, ‘I Got Stripes’. If you like proper country music, you’ll dig The Golden Age Of American Popular Music; More Country Hits. A follow up to his fantastic CD/LP Love Hit Me! Decca Beat Girls 1962-1970, issued last month, Mick Patrick has collected and provided the notes for a further CD collection of swinging 60s UK female pop artists. This time the label is located in London’s West End, Pye and its sister label Piccadilly, with as much beat music action to offer as the Decca collection. The title of the CD is taken from the opening 1966 killer over-drive fuzz guitar, big-beat workout, lustily sung by Jan Panter. The lyrics might be based on a nursery rhyme, but with drums and guitar this unfettered, who cares? Sandie Shaw, one of Morrissey’s favourite artist’s, delivers the dark and thrilling drama ‘Run’, Tony Hatch’s discovery Petula Clark belts out the driving ‘Heart’, Dana Gillespie fervently pledges to ‘Pay You Back With Interest’, Nita Rossi channels the Stones’ ‘Satisfaction’ on ‘Something To Give’ (written by Tom Jones’ manager, Gordon Mills) while Welsh Pat Harris & The Blackjacks attack The Swinging Blue Jeans’ hit, ‘Hippy, Hippy Shake’. The highlight of the disc could well be Glenda Collins’ 1966 performance of the apocalyptic Joe Meek number, ‘It’s Hard To Believe’. Collin was the crazed producer’s muse, with whom he had enjoyed some commercial success, but Meek’s dystopian vision of world destruction contained within ‘It’s Hard To Believe’, replete with futuristic production noises replicating the sound of space flight, was simply too much for audiences at that time. That could still be the case, but ‘It’s Hard To Believe’ is unforgettable. The only thing wrong with this release is that it hasn’t been issued on vinyl yet. However, the word is that situation is soon to be rectified. 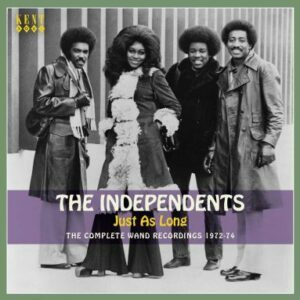 Compiled and noted by Tony Rounce, this is a fine compilation of all the recorded work created by one of the best Chicago soul groups of the 70s, The Independents. One of the great vocal groups of the era, featuring founder members and songwriters Charles Jackson and Marvin Yancy, with Helen Curry and Maurice Jackson, The Independents maintained a focus upon Chicago soul music while the Philadelphia sound swept across the world. The Independents’ hit recordings for the Wand label are prime examples of the enduring appeal of the very greatest 70s soul. Bittersweet smash hit ‘Leave Me’, the yearning ‘Baby I’ve Been Missing You’ and the epic two part opus, ‘Just As Long As You Need Me’, all conform that The Independents were the equal of any soul act of the day. ‘The Same Old Way’ carries echoes of the best of Al Green, while the wah-wah guitar driven ‘I Love You, Yes I Do’ and ‘One Woman Do Right Man’ are quintessential examples of Northern Soul, demonstrating that The Independents could deliver on the dance floor as well as melodious, reflective material. It is undoubtedly a shame that The Independents only enjoyed a butterfly existence, compared to many other soul groups of the 70s. Perhaps Charles Jackson and Marvin Yancy realised that they had come as far as they could with the band, and chose dissolution before dishonour. Whatever their reasoning, Just As Long stands as a continuing testament to the soulful beauty produced by The Independents. ~Ace Records can be found online at acerecords.co.uk, as well as on Facebook and twitter, as @AceRecordsLtd.